The four young Germans (20, 17, 17 and 18 years old) in the hard rock band Rebellious Spirit, which is fronted by a vocalist who's singing with a similar voice mode to Vince Neil in Motley CrÃ¼e had in the good old 80's. Rebellious Spirit's music is quite pubertal and there's a lot to wish for in the technical department and in the song writing. It sounds pretty thin and with wobbly choruses at times. That's my overall impression of 'Gamble Shot' and also that some of the tracks don't hold together completely. BUT they do also deliver a young energetic sleaze rock with a lot of raw, positive and aggressive attitude. The best moments are mostly in the quicker and straight rock 'n roll tracks like in:' Lights Out ', 'Let's Bring Back 'and' Sweet Access Right', all of which stay at an higher OK level. 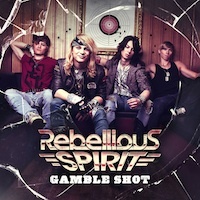 The album 'Gamble Shot' is a recommended purchase, if you're interested of new young melodic rock bands. We will absolutely hear more from these youngsters, that's my conviction. This is promising debut album, but they need more time to improve their technical skills and musicality to make a bigger impression on me.